This healthy, thick hearty stew is perfect for cold winter days. 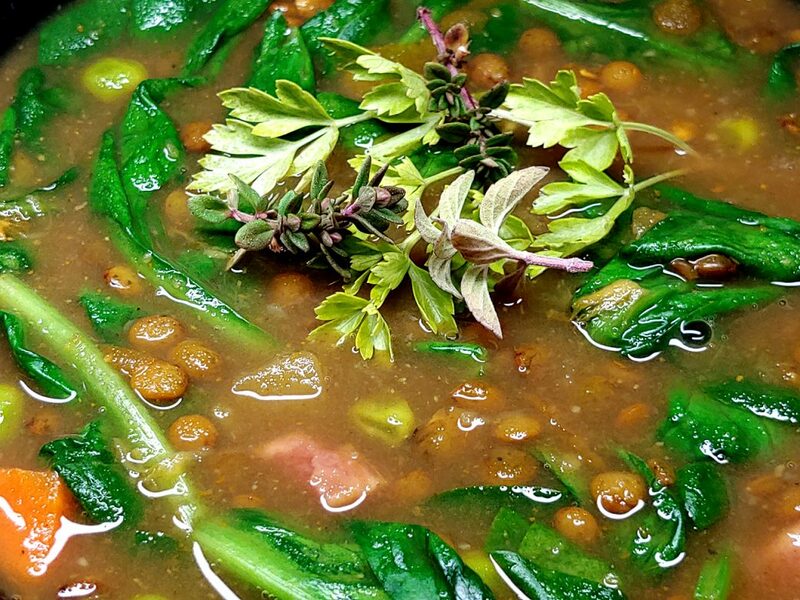 Deep rich curry flavors are infused in this fusion stew with fresh spinach, purple and white potatoes, lentils, veggies and added hatch chiles for the perfect flavor with some mild heat. Serves well as is or over rice. I topped this dish with fresh oregano, parsley and lemon thyme from my garden. Combine all the ingredients in 1 medium saucepan. Bring to a boil. Cover and simmer 35 minutes. For a thickener combine 2 Tbsp cornstarch or arrowroot in ¼ cup of water. After 30 minutes add the slurry to the stew. Mix well. Turn off heat. It will thicken in about 15 seconds. What do you suggest serving this over? Type of rice? We typically eat it as is but rice would make a nice way to stretch out this dish. I normally recommend wild rice, black rice or basmati.